"Lawnmower Maintenance And Postnatal Care" / "Ladders"
“Sometimes dead is better.” It’s no coincidence that of all the quotes tossed off by the thousands of characters in the Stephen King universe, Jud Crandall’s stern, yet folksy warning from Pet Sematary endures in memes and South Park references. Removed from its literal context, it’s a relatable sentiment about the dangers of nostalgia. The temptation to prod beloved institutions beyond their natural stopping points is always strong. It’s a temptation that becomes even more difficult to resist when it applies to interpersonal relationships or collaborative artistic efforts, when the point of conclusion has to be determined by the people least capable of making objective decisions. Watching Community in its improbable sixth season is challenging because Crandall’s quote, or at least the idea behind it, tints the experience. Fans have spent years arguing that some Community is better than none at all, and more than any other season, this one puts that notion to the test. Beginning with its widely reviled fourth season, Community has started each year like a cat that just emerged from a cursed burial plot. With each season premiere, the show returns looking like it used to, but something about it isn’t quite right, and only through careful observation can it be deemed trustworthy. This season is a bit different because never before has Community come out of the gate looking this much like the walking wounded. The show’s migration to Yahoo Screen doesn’t appear to have taken a huge bite out of the production value, but it’s gotten harder to abide the cast shake-ups. Dan Harmon did an admirable job dealing with the departures of Chevy Chase and Donald Glover, but with Yvette Nicole Brown and Jonathan Banks now missing, Community’s energy is palpably different. Harmon and his right-hand Chris McKenna know they have a lot of change to account for, and like “Repilot” before it, “Ladders” goes about making the case for Community’s continued existence. “Ladders” makes equally strong evidence in the cases for and against Community’s sixth season. With active vacancies at the study room table, Harmon is most concerned with drafting replacements, so “Ladders” spends the bulk of its energy introducing Paget Brewster’s Francesca “Frankie” Dart, an administrative consultant hired by Dean Pelton to address Greendale’s many management issues. As Community introductions go, Frankie’s is fairly standard, with what’s left of the Save Greendale Committee approaching her with suspicion and ultimately rejecting her for her no-nonsense approach. The issue of “what to do about Greendale” has gotten rather muddled. It’s shocking that the campus hasn’t been shut down and bulldozed by now given how many people have been tasked with fixing what the characters have repeatedly concluded can’t be or shouldn’t be fixed. Given the conceptual redundancy of the character, it remains to be seen how well Frankie fits in, but even at this early stage, Brewster is fitting in quite nicely. Both the character and Brewster’s performance is reminiscent of Parks And Recreation’s Ben Wyatt, which bodes well assuming the writers can resist a romantic pairing with Jeff. Speaking of Jeff, “Ladders” is the most settled and stable we’ve ever seen the character. For the first time ever, there’s not even a stray mention of Jeff’s lawyering past. Granted, there’s not much mention of Jeff’s professorial present either—he teaches classes and stuff, right?—but after years of resistance, Jeff has completely given in to Greendale. It’s an important development. At six seasons in, it’s time to stop playing coy about the fact that Jeff, Britta, Annie, and Abed are cursed by their devotion to the world’s weirdest educational institution. It’s also important, given all the student attrition, for the characters to assure the audience and each other that no one else is going anywhere. “Ladders” has so much housekeeping to do, including the explanation for Shirley’s disappearance (she’s cooking in Atlanta), pacing quirks were probably unavoidable. But with fewer characters to service and roomier, 28-minute episodes, “Ladders” feels overlong and occasionally indulgent. The speakeasy scenes could have benefitted from more merciless editing. Also, I get that the barrage of montages works better as a joke the more of them there are, but by the fourth montage, it began to feel like the episode was padded. This will presumably become less of an issue as the show works its new characters into the rotation. 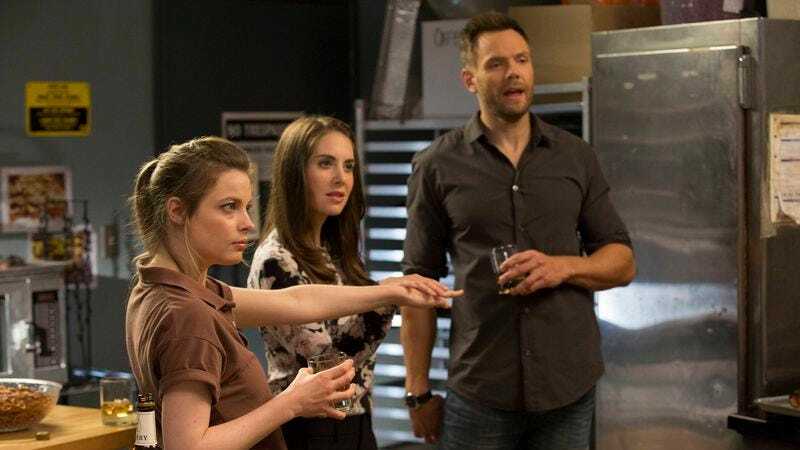 But when contemplating whether it might have been better to stop Community shy of the six seasons and a movie, needlessly super-sized episodes complicate that evaluation. There’s less fat on “Lawnmower Maintenance And Postnatal Care,” which introduces Keith David’s delightfully named Elroy Patashnik as well as Britta’s awesome parents, played by Martin Mull and Lesley Ann Warren. I’m not counting Dean Pelton’s adventures in virtual reality as fat because of its utility in introducing Elroy, but there was definitely too much time spent with the poor man’s Oculus Rift. Deb and George are a welcome addition, and they provide long overdue insight into why Britta is always Britta-ing every damn thing. It’s arguably the safe and predictable route to root Britta’s rebellious streak to her growing up in an excessively permissive, hands-off household, but it works, and Mull and Warren are just too good. The Britta story also features one of the best jokes of either episode, when Britta’s conflicted feelings about her parents is diagnosed as Jimmy Fallon Syndrome. It’s a classic Jeff line but it gets tossed to Frankie, a sign of how Community is still figuring out how best to reshuffle its deck. One thing is certain: Community’s sixth season doesn’t have any better idea of what to do with Professor Chang than any season before it. It’s less than ideal that of all the actors to depart the show, Ken Jeong stays despite playing a character who is entirely untethered from anything going on around him. Jeong remains capable of doing a lot with a little, but making the most of a one-joke premise like Chang’s swelling, infected cat bite might not be a feat anyone could pull off. But perhaps it wasn’t meant as a joke as much as a metaphor. If you’re going to stay enrolled in Greendale, you have to be prepared to do more with less. Who thought it was a good idea to put Britta in charge of the sandwich shop? And how is it possible no one has died as a result? The Shirley tag was terrific, though between The Butcher And The Baker and the Hard Drive And Wing Man gag from episode two, the show got a little too overeager with its meta-humor. Loved Jeff’s reference to the virtual reality scene in Disclosure, which is one of the most embarrassing things ever committed to film.